BRISTOL - All the Bristol Blues had to do was watch Michael Genaro go to work and provide a little bit of offense behind him. 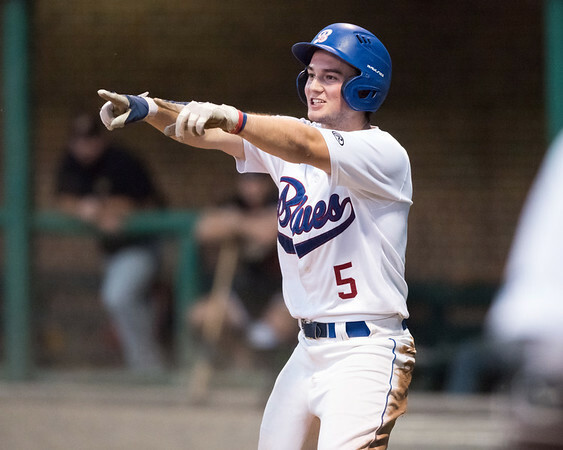 In what looked to be a pitcher’s duel early at Muzzy Field Monday night, the Blues were able to break through in the fifth to take down the Pittsfield Suns 4-0. The contest was a single-elimination playoff game, giving Bristol a spot in the semifinals against the Worcester Bravehearts starting tonight. Genaro proved why he is the ace of the staff, throwing his best start in the biggest game of the season. In 6 2/3 innings of work, the southpaw from Babson College gave up just four hits and walked two. He also struck out three Suns hitters. The starter did struggle with control early on, which is uncharacteristic of the lefty. But Genaro seemed to only improve as the game went on - allowing just two baserunners from the fourth inning on. Going into the game, the numbers appeared to be in Blues’ favor - Bristol had won 10 of the 13 matchups between the two teams in the regular season - but a solid start from Suns pitcher Izaiya Mestre made it difficult for the Blues to get much going offensively early on. In 4 2/3 innings, Mestre gave up the four runs on seven hits and three walks. But all of his effectiveness was in the first four innings, during which he held Bristol scoreless on three hits. The early success came as no surprise - in 4 2/3 innings against the Blues in the regular season, he gave up no runs on just one hit. By the time the fifth inning rolled around, the Blues were able to figure out Mestre. After Peyton Stephens scored on a wild pitch, Alex Loparco drove in two with a double down the left field lined, followed by an RBI-single by Dylan Reynolds to cap off the four-run rally and knocking Mestre from the game. Loparco did a little bit of everything for the Blues offense, going 3-for-4, the two RBI and a run scored. He also made two great plays on defense in centerfield, a diving catch in the first inning and a running catch in left-center in the sixth. The Blues will take on the Bravehearts in a three-game series, which begins today at Fitton Field. Game 2 will be at Muzzy with Game 3 - if necessary - back at Fitton Field. Bristol has had its fair share of struggles in the matchup, going 4-6 against Worcester this season. Posted in The Bristol Press, Bristol Blues on Monday, 6 August 2018 22:25. Updated: Monday, 6 August 2018 22:27.